Renewable energy usage has picked up lot of steam in the corporate sector what with carbon credit exchange and Corporate Social Responsibility. However, like a lot of other initiatives, cutting down on energy usage and investing on renewable power is seen as a cost which does not bear any returns. Well, to a certain extent short-term benefits for switching to renewable power may not be there. For a lot of companies, quarterly earnings are the benchmark and as such investing on renewable power may not seem like a strategic business driver. Be that as it may, a few companies realize the need for sustainable business and have been taking the initiatives to utilize renewable sources for their electricity needs. Of these Kohl’s Corporation and Whole Foods managed to source all their electricity needs from renewable sources alone. Given the size and scale of operations these companies have, this is a significant achievement and my guess is that these companies would have started implemented a renewable energy strategy atleast 5-6 years back. The report also highlighted other companies who are increasingly switching to renewable sources for their power consumption requirements. Adobe Systems , News Corp, Deutsche Bank AG, Starbucks, Metlife, Nokia, Allianz and Johnson & Johnson are some of the companies identified as leveraging renewable energy as source of power. It is interesting to see a lot of companies in the financial services sector being big proponents of renewable energy. One critical area I think these companies consume a lot of power would be in terms of IT infrastructure or data centers. Data centers are huge energy guzzlers and that could be a reason for high power requirements in financial services companies. 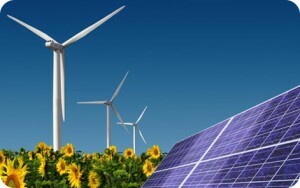 Companies in the financial sector have started increasing the procurement of renewable power to a great extent. Technology companies continue to be at the forefront of using renewable energy to power their operations. Companies like Intel, Motorola, Dell etc. have all been procuring renewable power for a long time and continue to do so. Recently, Google has upped its focus on renewable energy and is even inviting R&D folks to work with Google in generating electricity from renewable energy. I am also curious to know what kind of strategy IBM has for renewable energy. Sustainable business has been a key part of their Smarter Planet campaigns and it would be great to see if the company does what it preaches. Using renewable energy for electricity might still not have become a necessity but it is an eventuality. It is going to become a key component of sustainable business practice and the regulatory pressures are already making companies rethink their resource consumption practices. Switching to renewable power might be tad costly but in the long run, companies and the world at large stand to gain from it. So, the earlier more and more companies tap renewable energy for electricity they will not only turn themselves into cleaner and efficient companies but also contribute towards creating a cleaner world to live in. What are your thoughts on the usage of renewable resources for power generation in companies? Do you see this happening much more going forward and will majority of companies make the switch to renewable resources for their electricity needs? Thanks this info was very useful for my school project! Thanks very much………This helped with my school project. very nice web site …..good thought…. Awesome idea!!! It not only helps in social causes but also allows companies to save a lot of capital in long run. May be the set-up cost will be high but in long run company find them profitable. Even companies which are looking to grow and are just established ones can use these renewable sources of energy to a great effect. Thanks a lot for sharing this hidden news with us. I think India has a great chance to open its door for such green energy in the first phase because India is already a major electric hunger country due to its gigantic population. Even though India has no lack of fund by installing solar panels upon each and every roof bring black money back from abroad.